Transforming education and career pathways to help broaden participation in science and engineering. NSF has funded 67 launch pilots to date. The focus of these NSF INCLUDES launch pilots spans a number of broadening participation activities � from STEM engagement and preparatory experiences for students and other community members to educator training to new academic programs that expand access to STEM education. 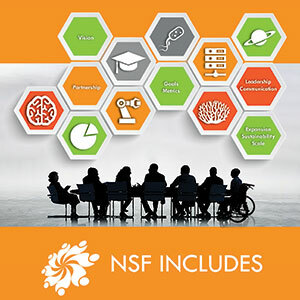 Multi-year NSF INCLUDES alliances will engage partners from private and corporate philanthropy, federal agencies and scientific professional societies. The program's structure will provide a networked testbed for research on STEM inclusion. This will enable participants to determine the key components and approaches that lead to progress in STEM inclusion, as well as the elements that allow successful local alliances to be scaled up for broader use. Developments from NSF INCLUDES will inform other possible ways through which NSF programs can integrate an inclusion and diversity mindset. Ten research and process "big ideas" that will drive important aspects of NSF's long-term research agenda, push forward the frontiers of U.S. science and engineering research, and lead to new discoveries and innovations. NSF is working to increase female and minority representation in STEM education and careers. NSF INCLUDES supports programs, networks and partnerships that empower women and minority students to pursue STEM education and careers, while broadening access to a greater range of opportunities.